With kindergarten becoming increasingly academic, I’ve noticed a push for parents to teach their kids to read before school even begins. 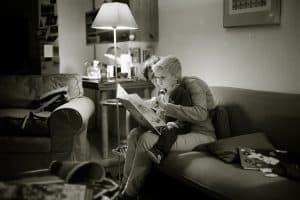 As a certified teacher, I can say that I do think there are other skills that are more important– like independence and kindness, to name two-but the need for early reading skills cannot be ignored. The Salty Mamas are all about raising readers, which means that we start them young. But rather than focusing on just letters and phonics, we encourage you to teach your child to be a reader– and that means going beyond the basics. Here are 8 easy reading strategies you need to teach your toddler to read- or teach your preschooler to read! We promise their future teachers will thank you for it. Reading should never be a chore, especially this early in life. Choose books that are brightly colored, interactive, and funny. Let kids choose their own books. Visit the library and explore new titles. Pick books that are representative of your culture. Give books as gifts for holidays, and let your kids see you reading in your leisure time. 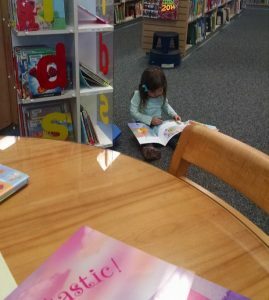 If you do nothing else to teach your toddler to read, let it be this- show them that reading is magic, and something worth doing. I know, I know. This is not a parents’ favorite way to read. But it is one of the BEST ways to teach your toddler to read. 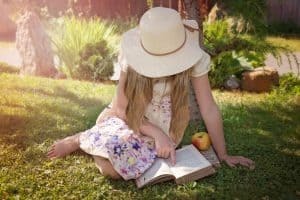 The more you read familiar books to your child, the better they will get at recognizing sentence and story structure, predicting the text, focusing on rhymes, and retelling- in a nutshell, all the good stuff. Try to choose books that won’t drive you crazy, and then read that book again…and again…and again. In teaching, we do something called a “Picture Walk” before we read a new book. We spend time looking at the cover, noticing the type of art or photographs that are included, and checking out features that are unique to the book, like dialogue bubbles or a Table of Contents. We talk about the pictures that we see, guess who and what the book will be about, and pick out which page we think is going to be our favorite. You can teach a toddler to “read” just by looking at the pictures. Children can learn a LOT from those little pictures, and this is a great way to get them engaged in the story long before they are able to read it for themselves. When we read with our kids, we often put on silly voices or say some sentences louder than others. Point out that punctuation once in a while- like, “Look, there’s an exclamation point. That tells me that this sentence is a little more exciting, and my voice should be louder when I read it!” Explain to kids what all those squiggly little symbols mean, and why we need to pay attention to them. We want the kids to actively listen to the story, and that means that they should be involved in telling it. So if you’re reading “Brown Bear, Brown Bear,” you might say “What do you see? I see a ____” and let your child fill in the blank using the picture to guide them. If there’s a rhyming phrase, let them supply the last word. For Green Eggs and Ham, you might say “I do not like them with a fox, I do not like them in a ____” and see if your child can name a rhyming word. You don’t have to make this a lesson, but it’s a great way to make sure their brains are engaged with the story. This is one you don’t want to overuse, but every once in a while, use your finger to follow along with the text as you read it. Better yet, ask your child to follow along with their finger as you read. This will teach a preschooler to read by moving from left to right, and top to bottom. As they grow, you can try to extend this skill by having them try to match their finger to each word as you read it, learning one-to-one correspondence and first-letter recognition as they go. The biggest mistake early readers make is that they aren’t monitoring their comprehension as they read aloud, and so they make errors. By showing them that all readers make mistakes and need to be checking their understanding, you are modeling habits that will make them much more successful readers in the future. Every once in a while, when you finish reading a story, ask your child to start at the beginning and “read” you the story using the pictures. Help them turn the pages, look at the illustrations, and describe what happened in that part of the story. You can check to see how much of the story they understood and they can get practice with the super important skill of retelling. Remember, teaching a preschooler to read is supposed to be FUN. Don’t turn it into a chore! If your kiddo is hesitant to do this, don’t push it. It will come with time. 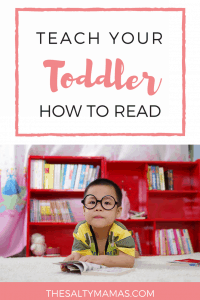 So is your toddler or preschooler going to sit down and read to themselves if you follow these simple steps? Well, not today they aren’t. But you’ll be setting the foundation for something more important- a beautiful, exciting, and fulfilling relationship with books that will last them their whole lives through. And isn’t that what we’re really trying to do here? So pick a good book, cuddle up with your kiddo, and soak in the time spent together. We guarantee that you will ALL benefit. Are you looking for MORE activities to keep your toddler learning and growing? Check out the 10 Activities Your Toddler Should Do Every Day. A fellow teacher’s stamp of approval means the world! SO easy to follow through on, and the kids won’t even realize you’re doing anything different! Love this! Such a great post, Jaymi. I learned them all right alongside you! Hope you’re doing well! I will definitely go for it as my 2.7 years old son love to read books. And these ideas are definitely helps me.